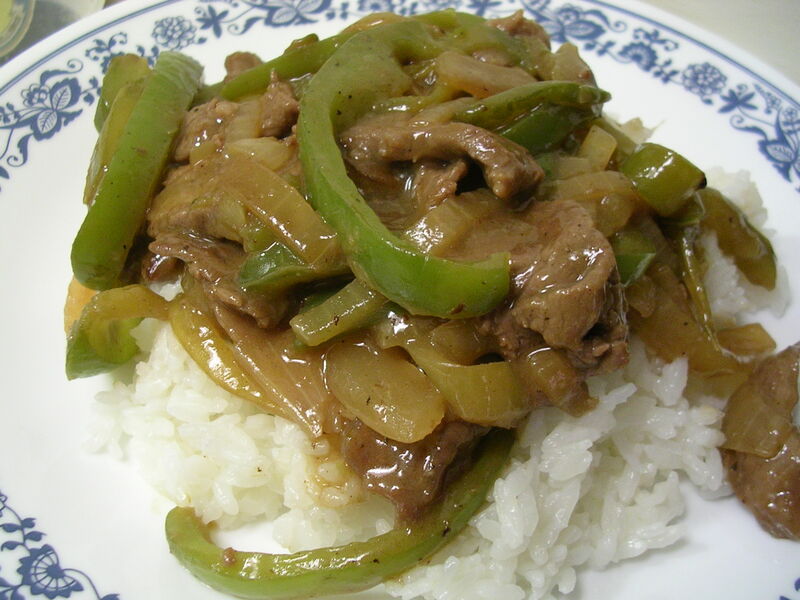 Admittedly, I need to get more creative about ways to eat peppers, because I think if I make pepper steak beef every time I buy peppers, that can get old very fast. The nice thing is that this time making the dish, we managed to improve upon our previous pepper steak beef, which was made with red peppers. I can't take the credit for the flavor improvement, because I was the one who did all the prep work, and my boyfriend did all the cooking (this kind of splitting up the dinner work is kind of nice, because our kitchen is much too small for two people to stand in it comfortable at one time). But I can say that I like the green bell pepper flavor better in the dish than the red pepper, and this time the beef looked a lot better (less pale and puny than last time). The sauce was also nice and thick, coating everything with flavor, whereas last time the sauce was plentiful but more liquid. From what I could tell, my boyfriend first stir-fried the peppers and onions until they were nice and soft and just slightly starting to char on the edges, and added sesame oil for some extra aroma. In terms of the meat, well I did the marinating, with salt, sugar, white and black pepper, rice wine, garlic powder, onion powder, soy sauce, and cornstarch. The sauce itself was made with soy sauce, oyster sauce, water, and a good deal of cornstarch to thicken it up. With 2 large peppers, 1 large onion, and about 8 oz. of beef, the proportions of the dish were just right, not too much of any ingredient. Yum! This entry was posted on Monday, January 14th, 2008 at 4:11 am	and posted in Chinese, cooking, Uncategorized. You can follow any responses to this entry through the RSS 2.0 feed.